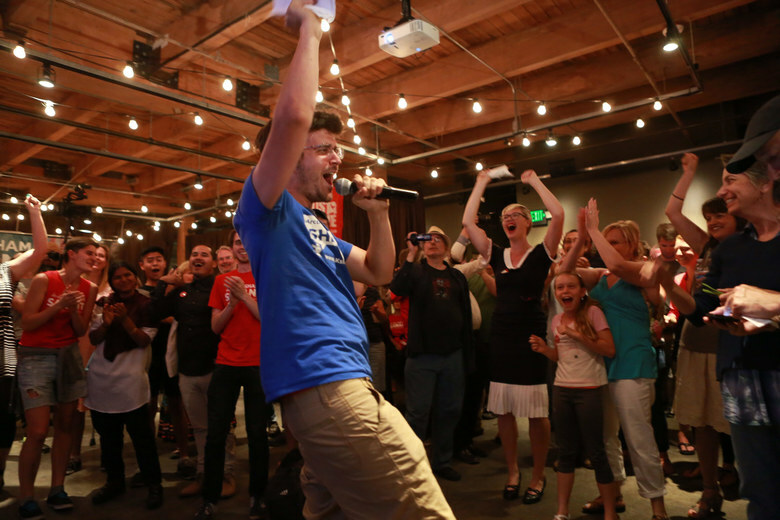 UPDATE: Kshama’s lead has increased and her vote total is now 52.03%. A fired-up crowd of over 200 supporters of Socialist Alternative Seattle City Councilmember Kshama Sawant gathered in the Melrose Market Studios in Seattle’s Capitol Hill neighborhood tonight to hear the result of the non-partisan primary for the Seattle City Council election. 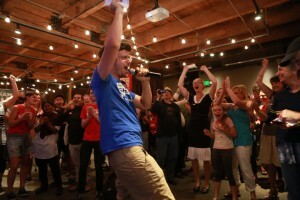 Many thousands more around Seattle and the nation were anxiously awaiting the outcome of the first stage of the most important electoral battle for the left in the United States in 2015, to hold the seat Kshama won in 2013 as the first open socialist elected to a council in a major urban area in decades. 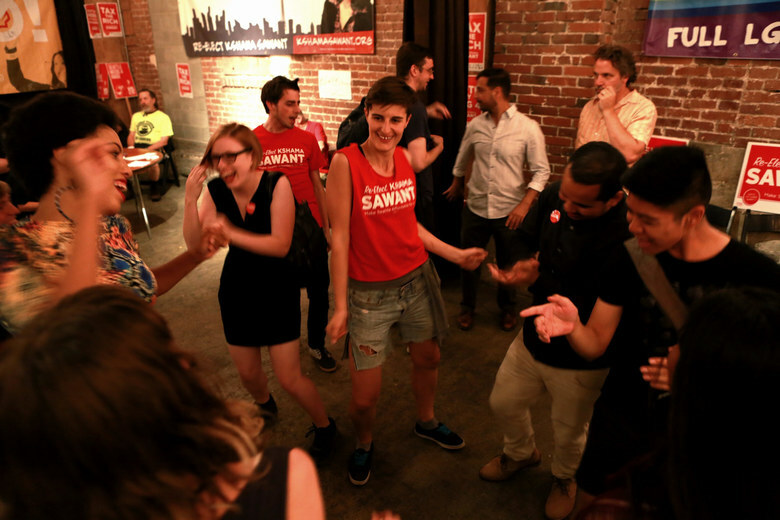 At 8:15, a huge cheer went up as the announcement came in that Kshama had received 49.9% of the vote, a full 15 percentage points ahead of her nearest opponent, Pamela Banks, in a field of 5 candidates. This result is a confirmation of the support among ordinary people in Seattle for Kshama’s work on the council over the past 19 months. Most important she played a critical role in winning the first $15 minimum wage ordinance in a major city. She used her position to help build, with union support, a grassroots movement, 15 Now, which has now spread to cities across the country. Kshama’s excellent vote came in a challenging primary environment where the electorate tends to be older and wealthier than in a general election. Big business has been increasingly pouring money into the campaigns of Kshama’s opponents, particularly that of Pamela Banks. They want to put an end to the experiment in Seattle which could become a “bad example” for other cities. The corporate media has worked hard to portray Kshama as “divisive.” In reality she has opened the doors of her office wide for working-class campaigns, LGBTQ people fighting a rise in violence, immigrants and others fighting a threatened 400% raise in rent in low-income housing, and Black Lives Matter activists fighting police brutality. As Kshama said tonight “what is really divisive is inequality.” It looks like a lot of people in District 3 agree. Kshama’s vote is likely to climb a bit in coming days as the late ballots are counted (Seattle elections are mail in). The result reflects a ferocious campaign with 600 volunteers, which knocked on 30,000 doors and raised an incredible $265,000, not a single penny of which came from big business. 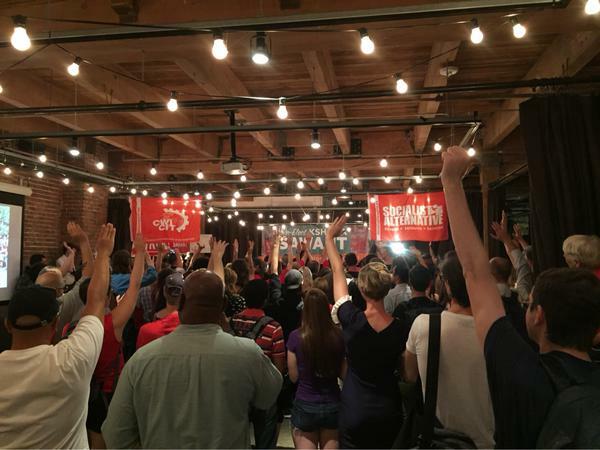 Hands go up as Kshama asks – Are you ready to knock on 80,000 doors? This result clearly gives Sawant an excellent platform going into the general election campaign. But, there is no room for complacency. Big business is very likely to step up the attack and pour hundreds of thousands of PAC money into this race, including for negative ads. It might seem incredible that so much corporate money would flow into one city council race, but big business is clear about what’s at stake. They see the massive excitement created by the presidential campaign of Bernie Sanders, who has taken up the call for a national $15 minimum wage and who calls for a “political revolution” against the billionaire class. There is a radicalization under way in the US. 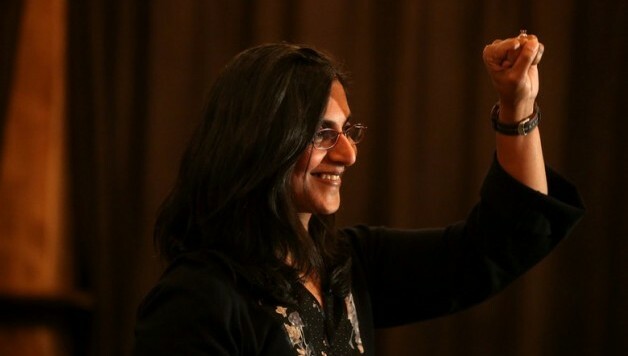 Kshama’s fight for re-election is the fight of all progressives across the country. Contribute to her campaign today and get active in Socialist Alternative!